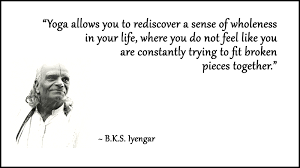 I met Yogacharya BKS Iyengar Ji once, many years ago. He suggested I take up yoga, but I ignored his advice. I will come back to our meeting later. It has taken decades for me to see what he was saying. It is said that you will meet the teacher when you are ready. Help is always there, right in front of your nose, but you will pass it by if you are not ready. My short story will hopefully provide motivation to others, regardless of their age, circumstances and disabilities. I was born in Kenya, East Africa. My first 7 years were spent in jungles, being at one with nature, and having very little contact with other humans including my parents. This was the start of my ‘awareness of life’. Unfortunately, whenever I raised any questions about life with grown-ups or priests, they simply brushed my concerns aside with a joke or a laugh. It was frustrating, and I began losing trust in the so-called priests. At nine years old I was sent to India to study in the Himalayan Mountains, but spent four years playing truant from school. I roamed the jungles, valleys and mountains. I would spend time with individual holy people, and my favourite place was the cremation grounds. A few years after moving to England at the age of 13, I ran off to London. Luckily I was accepted at a university. Again I spent much of the time searching for answers and attending lectures given by Noble Laureates. I was also a keen sportsman and became the university’s sports president. Unfortunately I suffered many injuries, but being very strong-willed I never paid any attention to my body and never worried about pain. After university I took up jobs in non-governmental bodies in order to help people. This took me to Africa, Europe, and finally to India. I was becoming more and more frustrated. While my friends were chasing status, marriages and homes, I was searching for answers to life and becoming more isolated. In the late 1970s and early 80s I ended up in India. The hippy era was coming to an end. I was working in Mumbai, and frequented Pune many times. The fashionable society I was living with were into many things, but I could see that it was all a game; they were concerned with who they know rather than the essence of learning. I used to be dragged from one teacher or holy man to another. I met Iyengar Ji on a number of occasions in the company of my hosts. I still feel his kind, penetrating eyes as he looked at me and suggested that I take up yoga and that it will help me. Because I was with my hosts, I felt it was inappropriate to raise my issues in case I was perceived as taking advantage of the situation. I kept quiet. I looked at my hosts who were all overweight and full of themselves, and in my ignorance and arrogance I equated the great teacher with them. I was already feeling frustrated with the extreme poverty I saw in India, and I told Iyengar Ji I do not believe in circus acts. The great teacher smiled and accepted my reply. My isolation and my frustration made me blind to the fact that the answers I was looking for were staring me in the face at that very moment. I rejected Iyengar Ji’s recommendation to do yoga, and continued with my business back in Britain. I continued to search for spiritual guidance through my intellect and ego. In 2008 my business collapsed, and you could say my life collapsed. I lost everything, including my finances. I became suicidal, confused, and could not understand what was happening to me. My body was giving up on me. This could have been my greatest period of reflection, but no. Instead, I managed to get a full-time job as a senior clinical psychotherapist. I was working 18 hours a day, and I was totally at the mercy of my ignorance and arrogance. I took pride in my work helping others, and disregarded my own needs. In 2011 I collapsed at work from over-work and was diagnosed with septicaemia. I had no idea what that meant. I was isolated, lost and helpless, and did not know how long I would survive. Although I worked in a medical setting, I had to depend on doctors who spoke to me in a language I did not understand. For somebody who has not been to the doctor’s for most of my life, from 2011 I was having 2-3 appointments with the doctor and hospitals every week. The use of my legs became so bad that amputation became a real possibility. I became diabetic, with high blood pressure and arthritic joints; I had difficulty walking (I used two walking sticks) and was in considerable pain. From my own clinical practice, I had known that when some clients go so low that death stares at them, they seem to develop such extraordinary insights and courage that they become well. These were the thoughts which started to take root. Somewhere in the back of my mind, I knew I could be helped. But at that moment I knew I had no way of accessing help, so I made myself walk and be in nature. I started taking care of my body, doing gardening, and clearing clutter in my house. I did not want others to clear my mess after I am gone. I spent every moment in deep self-reflection. It helped me to slowly start looking at my predicament. I was a born a Sikh and I had always dreamt about learning to read the Guru Granth Sahib in Gurumukhi, but because of the busy-ness of my life, I never had time to do it. However, I received a rare opportunity when elderly monks agreed to teach me to read the Holy Book. Just like with Iyengar Ji decades earlier, I raised my issues that I don’t even look like a Sikh, and how in my 60’s am I suddenly going to change? The most senior monk asked me one question: Was I going to learn through the heart or through my assumptions? He told me that if it is through the heart, then he will accept me. I started learning, and slowly I was accepted to read Guru Granth Sahib in the monastery. But I had to face my next challenge. My body. How do you sit on the floor, cross-legged, for a minimum of two hours? I have never sat on the floor in my life. I cannot sit on the floor for two minutes, let alone two hours. The pain in my legs, hips, chest, shoulders, and neck was unbearable. The sitting was impossible; I had to move my legs this way and that way. It was a real drama. The pain began with my legs, and then some other part of my body would start crying out for attention. It was like dealing with a mental hospital inside me. Finally my body was going to take revenge on me! I toyed with physical exercises and physiotherapy. They were helpful, but did not have the results I was looking for. I was clear that I needed a step-by-step approach in order to slowly start freeing my body. What do I do? Where do I go? I was under a great deal of stress. I felt lucky to have been given a role of praying at the temple, but my body was in pain. Drugs were not an option; they would just send me to sleep. Will I now lose my dream because I have neglected my body? 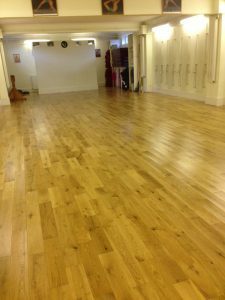 One day I was passing Iyengar Yoga Birmingham, which is just 100 metres from my home. It has been there for 13 years and I pass it many times a day, but it never occurred to me that this is where I could get help. I rang the bell and Andrew, the teacher, came to greet me. I explained to him my problems. 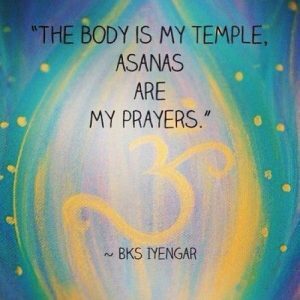 We made a connection – I would describe it as a deep, spiritual connection – and he explained to me how Iyengar yoga works. It is a step-by-step approach, using props so that you push your body to your limits without overdoing the stretching. I thought I’d give it a try. 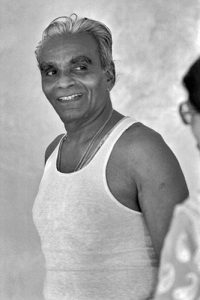 As I turned to leave the building, I saw the portrait of Iyengar Ji, and said to Andrew, ‘I met Iyengar Ji 30 years ago, but I rejected his suggestion to do yoga’. It was both an embarrassing moment for me, but also, at the same time, I knew I was in the right place and that I was open to learning. As I hobbled home, in a great deal of pain, my mind went into overdrive and I almost decided not to pursue this route. Fortunately, competing with my pride and embarrassment was the burning desire to take care of my body so that I could carry on with the prayers. This tug-of-war kept me awake all night, and in the morning I went to the class. I arrived full of doubt and conflicting thoughts. I was shown the mat and I commented to Andrew that I have never sat on the floor so I don’t know how to sit. He told me I needed foam blocks. I sat on eight of them, stacked 4-high, so that I could bend my knees a little bit. As a 67-year-old Indian, I felt embarrassed. I felt that I am going to be judged, and that some people may think I am a drama queen. Andrew was firm, very instructive, and explained to me why I need what I need. Also, I could see some other students having the same sort of problems I was having. I attended three classes that week, and each time I felt my body opening up. I knew I was in the right place. Very soon I could walk home without using the walking sticks. A few weeks’ later I underwent a routine medical check. My blood pressure had returned to almost normal and my diabetes had come down considerably. Two months later I amazed my physiotherapist by touching my toes – my arthritis had subsided. I was astonished at the difference yoga had made to me in such a short time. With improving health came other challenges. Being intellectually oriented, my mind wouldn’t rest. I have read many books on enlightenment, and the madness of the mind makes me believe that I am already enlightened. 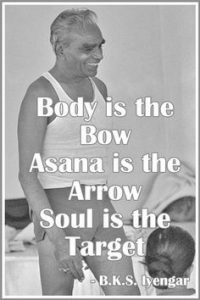 I read all of Iyengar Ji’s books and, as usual, the ego kicked in. I began discussing the books and intellectualising them, and my focus shifted from the practical to the theoretical, to the point where I was already imagining being a teacher of yoga. I was astonished at how quickly my mind hijacked the whole process, and suddenly, in my arrogance, I had forgotten the pain, isolation and lonely nights thinking of death. I had to get back to the practicalities of the beginner’s Asanas. I progressed in them slowly and steadily, and began realising the subtleties of the poses. There is much more depth than I realised; a depth which will probably take many years to fully appreciate. It has been a very humbling experience. I can now sit with crossed legs on three foam blocks. My posture, my walking, and my general health have improved beyond all recognition. And when I go to prayers now, I can bend my legs in such a way that I can sit for 20 minutes. The more I focus on the poses and reside in the moment, without showing how hard I am working, the more I am realising that all I have in any moment is where I am in my body, and all I have to focus on is now. Be in the present and be in contact with the body. This is going to be a constant challenge as I experiment with and experience the sensations of each asana, and work methodically, step by step, fully internalising the experience. I have become aware of how my mind has a tendency to take short cuts rather than exercise discipline, because after the first few classes I was already asking the teachers when I will be joining the advanced yoga class. The biggest challenge I face is to avoid intellectualising and discussing yoga. It is simply about being in a pose. 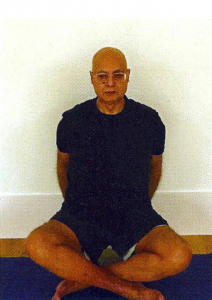 For example, doing Tadasana, there are so many things to be corrected; it is not just about standing upright. Also, I have to be aware when I am walking: aware of the position of my feet, my legs, my spine, my shoulders, my neck, and my head. That has made a vast improvement to my health, and every day I keep on discovering things which need correcting. I am on a long journey, but that is not an issue. I feel – for the first time in my life – that I am being guided to take one step at a time, and am able to gratefully accept the guidance I am receiving. I have taken the first steps on this journey and I can see that I have a real possibility of being congruent, peaceful and contented. In my clinical psychotherapy work, I have observed and witnessed that some people actually die in ignorance and a great deal of pain, both of mind and body. I consider myself very lucky that I am receiving a priceless gift which creates the possibility that the last moments of my life will be in conscious awareness. I am appreciative of my teachers, Andrew, Jayne and Clare, and their constant encouragement, precision, and commitment to making sure that I keep my intellectualism in check as they guide me through the step-by-step process towards my health and well-being. The fellow students are a great inspiration also, as we motivate each other on the journey of true wellness. So, not only is yoga helping me to get my body in shape, it is also having a profound effect on my mind. 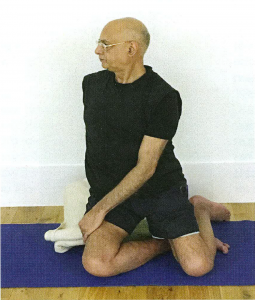 I have noticed that I am taking very slow steps to quieten my mind, and I am thankful to Iyengar Ji for his meticulous research of the ancestral knowledge, for the example he set with his life and his practice, and for making yoga practical and accessible to modern society. A true Guru Ji.